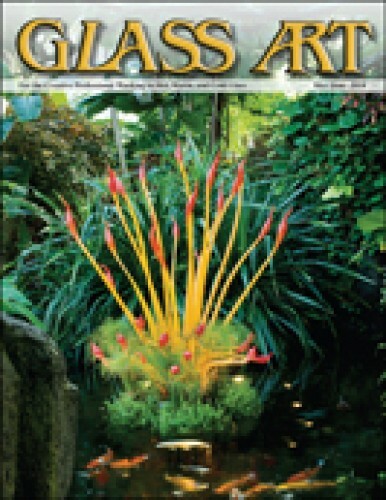 Glass Art editor Shawn Waggoner reminds readers that summertime is a great time to learn new techniques at the upcoming annual conferences and seminars, and by taking advantage of the live two-hour “No traveling required” Glass Expert Webinars™ from sister publication, Glass Patterns Quarterly. The installation of Dale Chihuly’s magnificent artwork in the conservatory environment presents his sculptures and surrounding plants in a new light. His degree in sculpture helps him design the armatures that hold his infinite combination of glass parts in a way that resembles avant-garde sculptures of the 1960s. For more than thirty years, the Buyers Market of American Craft has showcased the finest handmade products by American and Canadian studio artists to qualified retail buyers. The show will be rebranding itself in 2015 as the American Made Show and will relocate to Washington, D.C. The Crucible provides cutting-edge arts education programs to 5,000 adult and youth students annually in many disciplines, including neon, glassblowing, and ceramics. This nonprofit was founded on the principle of reusing and repurposing objects, as well as using a solar photovoltaic system on its roof to provide an alternative, renewable energy source. Sibylle Peretti’s art features layered panels and cast glass sculptures that pose questions about identity and the way we experience ourselves in the world. Her tributes to childhoods lost are often exhibited in pairs, and they converse, without words, with one another and the natural world. The Contemporary Glass Society and the National Glass Centre joined to select artists for a new showcase of contemporary glass art in Sunderland, England. Included are works ranging from elegant yet functional tableware to vibrant sculptural pieces. This collaboration begins a commitment to bring the magical medium of glass to the widest audience possible. 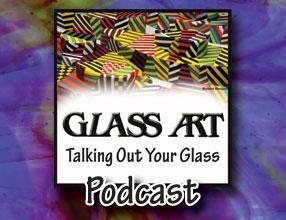 Gloria Badiner trained as a scientist before choosing a life in glass. Now she makes commissioned and custom kiln formed glass for architects, designers, and furniture makers that includes cast panels, high-relief tiles, and site-specific sculptural installations. The artist works in mixed media and is currently focusing on the theme of hunger in America. Cathy Coverley shares techniques for designing and creating cast glass using the bas-relief method. This first of two parts discusses creating a small segment of the design in cast glass to show clients for design approval. A clay positive is then created carving the layers of clay to achieve the desired result. Glass artists who get involved in their local communities will find that the rewards can be great. Teaming up with other events and small local businesses will help both partners draw in a new audience of clients and provide a good way to build or expand a client contact database. Glass pipe makers have worked outside mainstream culture, but now, groups of artists, including the Glassroots Guild, the Armadillo Glass Initiative, and the Michigan Project, are sponsoring philanthropic events, making and selling glass at major trade shows, on Facebook, and in silent auctions to benefit various charities. Dan Hohl is known for providing excellent service to his customers. A key part of his retail revenue comes from a quasi-cooperative wholesale program that he operates for local cottage industries. Hohl attributes the strength of stained glass in the hobby market to people’s desire to make their homes unique. Photography by C. Harrison Conroy Co. The 2014 annual AGG conference, “Glasstopia,” the perfect place for glass professionals, will take place in the idyllic community surrounding Bryn Athyn Cathedral and Glencairn Museum. The full conference will feature tours, workshops, demonstrations, lectures, and panel discussions amid one of America’s premiere collections of medieval glass art. The Bryn Athyn Historic District in Bryn Athyn, Pennsylvania, provides an especially unique environment for stained glass. Founded in 1877, this small private liberal arts college will host workshops on glass painting in architectural applications with J. Kenneth Leap and traditional glass painting and Vitri-Fusáille® techniques with Peter McGrain. Chilean artist, Isidora Paz Lopez was approached by the local Mapuche community to create a mosaic wall for the local railway station. Since then, over 4,000 meters of drab concrete columns and walls are now adorned with mosaics created with the help of volunteers and mosaic artists from twenty-two countries.